Southern Humboldt’s Dimmick Ranch was scheduled to be sold at a foreclosure auction on the courthouse steps this morning. But the sale was forestalled by the ranch’s owner, Tom Dimmick, co-general on one side of the great SoHum Reggae Wars, as he filed for bankruptcy in an Oregon federal court yesterday. Dimmick’s bankruptcy petition can be found here. Curious: Though the bankruptcy covers Reggae Rising and Dimmick Ranch LLC, in addition to Dimmick as an individual, it estimates that there exist only between one and 49 creditors who are about to get stiffed. One of them is sure to be Redwood Capital Bank, which lent Dimmick $1 million back when he was trying to develop the ranch into a concert venue. But it would not seem to include the many people who bought advance tickets for Reggae Rising 2010, only to fight unsuccessfully for refunds when the festival was canceled. Ha ha Tom. You get what you give you give mo.fo. Sorry to hear others are getting the shaft. old news... Time to to put the Reggae Rising debacle behind us. Not sure how good this is gonna come out, but here some from my tic stub collection. ROTR 88 & 89. Good Times. Thats awesome DJ trees!! I keep all my ticket stubs too! my first year was 05!! LOL i wish i was around for the 80s to enjoy the great artists of that time! Just curious can you remember any headliners from those years?? The details are pretty hazy hehe. But the stub from 88 says Judy Mowatt, Burning Spear, Messenjah, David Lindley, Rankin Scroo & Ginger. And from memory 89 was Sugar Minott, Israel Vibration, Joe Higgs... that's all I got. I remember having a most excellent time on both occassions. I did not manage to keep all the stubs, but I made an effort. A few others I have that are relevant: Reggae Sunsplash 89 - Greek Theatre, ROTR 90, Reggae Fest 91 - Greek Theatre, Shabba Ranks & KRS One 92 - Berkeley Community Theatre. There are so many more that I failed to save the stubs. My first concert was UB40 at UC Davis in 84 or 85. Now that I think about it, Pato Banton was at the 89 ROTR as well and that is funny because I was a little punk then and since have opened for two of the acts at that show. Pato and Israel Vibration. To blessed to be stressed. Edited 1 time(s). Last edit at 09/28/2012 10:14PM by DJ Treez. '89 was my first year! The summer before my senior year, was starting my Rastafari path and met my first Rastas. That was a great day. Looking 4ward to the new/OriGinal venue! I'm so glad they are finally making star wars 7 , 8 , and 9. I can't wait to see it. Can I buy a ticket now? Edited 1 time(s). Last edit at 10/03/2012 11:07PM by randomguy2u. ...I thought that a MAJOR sticking point blocking the return of ROTR was no parking on 101 , Friday AM before the land grab...NO? I hope they take back their coveted place on the first weekend in August,then all will be well in the world!!! NEWS/Disney Not Stopping at Star Wars 7: 3 Films and More Coming! Now can we buy tickets?? There permit to return to French's Camp this August WAS APPROVED by the planning commission last night....! I heard the same thing. I was looking at the permit and it looks like they are only allowing for 4,000 on site campers with 6000 total tickets being sold. Hopefully the smaller crowds can keep the vibez on point. Also, no crosswalk to get across the highway. WOW, Only 4,000 camping passes and 6,000 total. That is smaller than I expected. Will be interesting to see what kind of lineup they come up with. Hopefully they pay the local law enforcement off. I just decided to go one more time and got my favorite camping site reserved at Richardsons Grove State Camp Grounds. That would be campsite #161. Still lots of sites left in that area of the campgrounds but you must start your camping dates on July 31 or earlier to reserve now in January. The remaining sites will go fast come Feb 1st. My wife and I attended ROTR for eleven years in a row from 1991 when it first became more then a single day event. We stopped going when People Productions took over and the crowds got bigger and uglier. It will never be like the early 90's again but we decided to go one more time since the camping experience is great and Richardsons Grove is such a lovely place and a delight. If the vibe in Richardsons Grove is anything like it was before we will be happy campers, so we are gonna chance it. Its about a 20 minute hike from the campgrounds to the venue. If anyone else is interested in camping at Richardsons Grove and has any questions, ask away as I might be able to help. Love Richardson Grove! 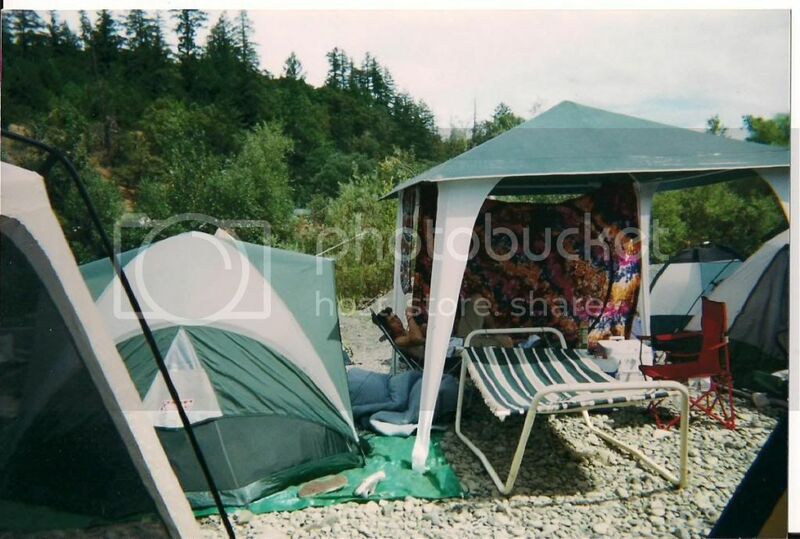 Our buddies had the large teepee on the other side of the river and we stayed there often. Not going this year, but maybe next- one festival a summer is all we can do. 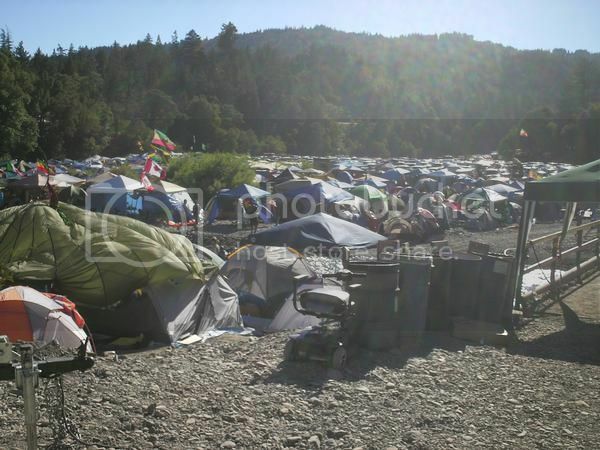 any idea if the trail from Richardson Grove to Frenchs camp/Cooks Valley will be cleared out by ROTR 2013? Last year was my first time attending in a few years and the trail had overgrown. My buddy and I attempted to take the trail late friday night at ROTR 2012 only to find out the trail was overgrown. Bless!! The main road is the main trail. Rotr will install a bridge over the eel river from the main road to the old bowl. It is a very simple walk, maybe 10 min from the gas station to the concert stage. Yeah, but some of us are not camping at the gas station, we are camping in the Oaks Flat section of Richardsons Grove, and that a really long hike if you have to go out to the 101 and South down the highway. 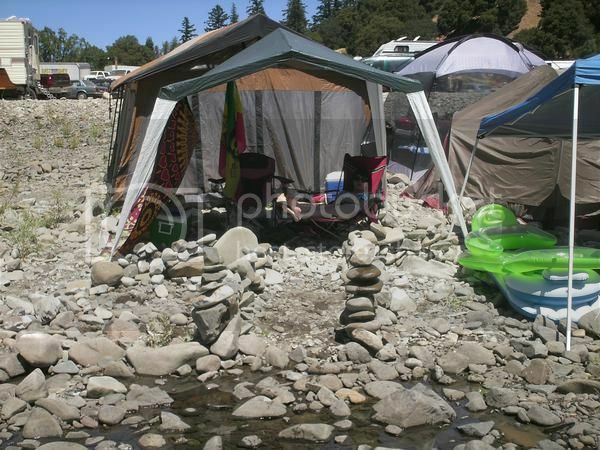 In prior years, the people running ROTR provided a back entrance into the bowl to accomadate the hundreds camping in Oaks Flat. Most of the trail to the bowl was a fire road leading out the back of the campgrounds...perhaps the trail down the hill from the fire road is the part that is currently overgrown. The only other option to the 101 is too hike about 1/4 mile or more over huge river rocks and then wade the river if its low enuff...not something you want to do, especially at night. Sorry wise. I thought the enterance to R.G. Was directly next to the gas station. My bad. The main 3-day festival will take place Friday through Sunday, August 2-4, and a limited number of early arrival tickets will allow access to the grounds and an extra evening of entertainment on Thursday, August 1. A total of 6000 tickets will be made available to the public, with only 2500 of those being early arrival tickets, and they are expected to go fast due to heightened interest in this special celebration. Tickets will be priced at $160 for the 3-day pass or $210 for the 4-day early arrival ticket. Please note that camping will available on site for an additional price of $40 for the weekend, which will be assessed upon arrival for those wishing to camp. Randomguy2me, you are accepting tickets from people who bought for Reggae Rising? Or was there a ROTR show in 2010 that did not happen? I just remember Reggae Rising. Thanks for the clarity. Edited 1 time(s). Last edit at 01/15/2013 06:43PM by rappy heggae. Tickets will be priced at $160 for the 3-day pass or $210 for the 4-day early arrival ticket. Please note that camping will available on site for an additional price of $40 for the weekend, which will be assessed upon arrival for those wishing to camp. This is priced more than SNWM and California Roots festival! They better produce a lineup for these ticket prices. The camping info is really vague. Looks like a way to extort people at the gate who are coming to camp. My hard earned dollars are going to SNWMF and California Roots Music & Arts Festival. Edited 1 time(s). Last edit at 01/15/2013 07:36PM by J_72. I will not be attending ROTR, I am excited for the 20th anniversary of SNWMF and I always go to NWWRF. Two festivals a year is about all i can pull off. I heard that NWWRF is going to update their website this week or next and should finally have a venue listed. Totally different festival man... but you already knew that. Why are you being so cynical? Do you have a reason for not wanting ROTR to be successful? I get being pissed at Reggae Rising for screwing people by selling tickets for a show that didn't happen but ROTR never did that. My bad, I assumed you had never been to ROTR. I still think you're making a mistake not going, I would think ROTR would book an epic line-up for their return to their roots. Reggabe, you think that ROTR lineup will be epic?? I am unsure of that. THey are only selling 6,000 tickets. I guess I figured it would take them a few years to get some funds to have that epic lineup. I dont really know though just speculating. Dont get me wrong Reggabe, I would love to go to ROTR but NWWRF is the weekend right before and I can attend the festival for under $250 and hopefully they will have a great lineup as well this year. On that CA Roots festival why are Rootz Underground and Don Carlos so far down on the flyer?? Those are way better artists IMO than any of the headliners. I guess others may not feel that way though. Is Slightly Stupid reggae?? They are coming to Bend, OR as is Iration and Rebalution. Are those 3 bads worth seeing live?? Thanks! Yeah my brother is a big fan of them but I dont care for their music. I can listen to it once or twice and then I am over it. But music live is always different. I will probably go to all 3 shows in Bend because we dont get much reggae music! But big up to Ises Productions and Rebel Lion Events for getting Anthony B to Bend, OR this monday!! To me, ROTR returning to French's Camp is a bigger occasion than a SNWMF 20 yr. reunion. You just can't beat that location. Rebulation should just forward their checks to Bud and Eric and some to Slightly Stoopid. Nice one Joshwa! i completely agree! This year's Reggae on The River is going to be the beginning of wonderful reggae music flowing through the redwoods in August. The Mateel has worked very hard the last few years holding the event in the park.....Working to make sure as we grow we can present a world class venue. The past is gone, we have learned hard lessons. Our goal is to make ROTR an event we can bring our friends and family and have a safe irie time. The old bowl at ROTR is the best outdoor music venue in all of California. Period!!!!! Love Rocker T! He is california roots at its finest! Always happy when I see him performing! For a business that makes 60% of his profits during that short summer period, I can understand his concerns. returns home to French's Camp August 1-4, 2013! This Friday, February 1st at 12:01am, online ticket sales will begin for the 29th annual Reggae On The River™. 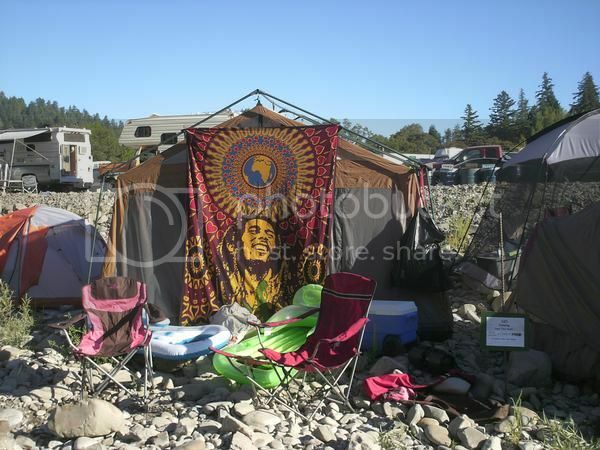 Making a triumphant return to the festival’s original French’s Camp venue, located just north of the Humboldt County line near Piercy, CA on August 1-4, 2013, reggae fans worldwide are overjoyed at the news of the festival’s homecoming and tickets for this highly anticipated event are expected to go fast. The main 3-day festival will take place Friday through Sunday, August 2-4, and a limited number of early arrival tickets will allow access to the grounds and an extra evening of DJs and special guests on Thursday, August 1. A total of 6000 tickets will be made available to the public for the 2013 event, with only 2500 of these being early arrival tickets, so don’t delay in making your plans. $250 - 4-day early arrival ticket (includes camping on site). Allows access to festival grounds at 8am on Thursday, August 1, plus an extra evening of DJs and special guests. $190 - 3-day main event ticket (includes camping on site). Allows access to the festival grounds at 8am on Friday, August 2. $250 - RV parking Limited space available. Advance registration required. Ticket/ RV sales begin at 12:01am this Friday, February 1st and they are expected to go fast. Local outlet sales in Humboldt, Mendocino, and Sonoma Counties will begin shortly thereafter. Don't miss this historic homecoming celebration! Stay tuned to this website for all the details and be sure to join the ROTR newsletter where you’ll get a sneak peek in coming weeks of all the epic talent in store for this very special Reggae On The River™ homecoming celebration. For more information call the Mateel office at (707) 923-3368 or send an email to office@mateel.org. You can see lots of photos from the 2012 festival in the ROTR 2012 Photo Gallery! Thanks! Edited 1 time(s). Last edit at 01/30/2013 03:10PM by westafari. They don't have to open their books up to anyone. They are not a non-profit whereas the Mateel is a non-profit and by law has to open their books up to anyone who requests to look at them. Get real and get reasonable. The man has a valid point and no amount of shuttling is going to remedy this situation. Do you really think we are all going to flock to the shuttle to take a two hour trip to just get across the street? Give the man his store. That's the irie thing to do Mateel. HA! That's funny Digitalguise. Does it come with a Chiropractor? This new ticket/camping fee is fucccced...So for those of us not camping onsite, our ticket prices just went up. Yeah, that was a poor decision on their part from a PR standpoint...as well as a matter of fairness. First the three day tickets were $160, and now they are adding an additional $30 camping fee to each ticket whether or not you camp at the venue. Raises an additional $180K in revenue but they should of thought of that before saying the tickets are priced at $160. And in addition they are charging $40 for each car into the camping area. Hey, capitalism and the free market operating at its finest. Incidently, that reminds me of how some Caribbean event promoters operate. If the event is really popular and theres a big line and it looks like they will sell out and reach capacity, they start telling the people in line that the ticket price is going up and keep increasing the price with the last people allowed in paying something like double or more then the original ticket price...pretty clever, eh? Charging 40 more for parking is such a garbage way to gouge people. Shame on carole Bruno and the manteel. Shame!!!!! Shiiiit, I got a 22 year streak.....not gonna break it for anyone. Gotta get back to my Frenchs Camp Roots!!!! Gwaaaaan So! BIG UP SIERRA NEVADA WORLD MUSIC FESTIVAL What an initial lineup announcement. All I ask before buying a ticket is SHOW ME THE MUSIC -- BOOM! -- SNWMF keeping it real with the music. Not everyone has money to throw around renegade sound. That "then don't go" crap works on children but not full grown men! Alright full grown man calm down, I really doubt 40 bucks is gonna break your bank. Yea I agree it's a chincy way of doing things but at least we get to go back French's. You know you're gonna go anyway, so chill out.